Wisconsin School Social Work Association has begun an initiative to support our members with an opportunity to fund a special project through a mini-grant. WSSWA members can apply each year for a grant up to $500 to support a professional project. We were interested in helping our members try a new initiative or innovative idea that would be used to directly impact or benefit students and/or families. We were pleased to announce the 2018 grant recipients! Shannon will use the grant to support the addition of a sensory room for special education students and students with IEP's and 504's in her middle school. This room will provide multiple sensory toys, furniture, and objects needed to regulate students who need a break from the classroom. At this time, when students need a sensory break, they take walks or use PE equipment. This room would provide a supervised, stable, and consistent place for students to decompress with actual sensory equipment rather than makeshift sensory toys. Margaret has requested funding to purchase a curriculum called FearlesslyKIND to be used with students in her district. Margaret works in a rural community that has limited access to mental health resources for her students and families. This year, Parkview School District hired Margaret, their first ever school social worker, and charged her with running groups and supporting the mental health needs of the students in her district. She will be using this curriculum as one method to addressing the needs of her students. Ashlee intends to use this grant to helping to improve the attendance at her two elementary schools. She plans on purchasing alarm clocks for students who have emerging attendance needs or who have met the criteria for an attendance conference. She also plans on using the grant to create an incentive program that would include competitions and for incentives for students and families that have increased attendance. Megan will using her grant money to support the Parent Advisory Committee (PAC) within her district. This is a new collaborative effort between our elementary school, parent volunteers, and community stakeholders. Their goal is to provide support and resources to families on parenting and school related issues while increasing family engagement in the educational experience for their children. They have outlined a number of ways in which they will increase parent engagement within their district including creating a “Parent’s Cafe, sponsoring Family Nights, and creating a “Parents University” and creating a family resource library. The 2019 Mini-Grant application will be available in the fall. Please check back for more information! 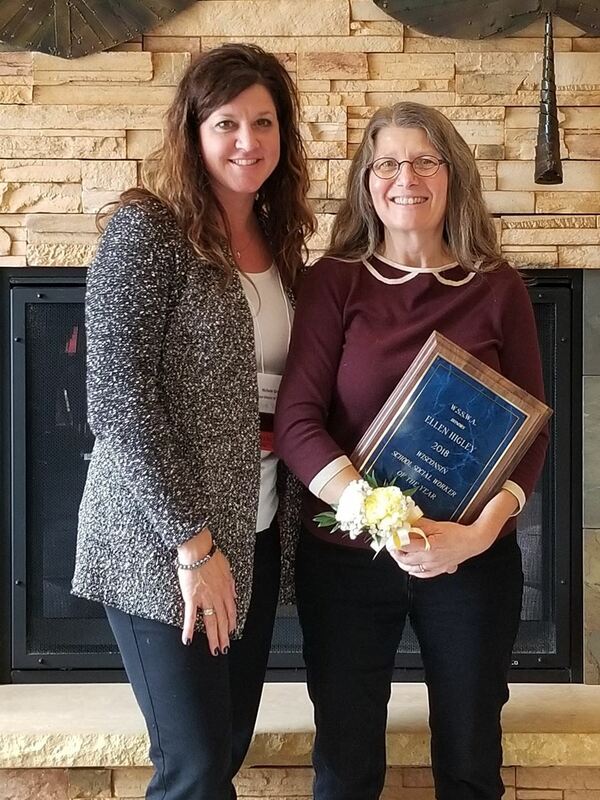 Ellen Higley has demonstrated excellence and leadership as a school social worker for the past 20 years in the Eau Claire School District. Prior to her employment as a school social worker, Ellen has held numerous social services positions for shelters, treatment centers, and counseling agencies. Throughout her career, Ellen has been a leader in development of programs and services that have impacted youth, schools, community and the profession. Jodi has worked in the the Shawano School District since 1999. She started at the high school, implementing the SADD program, a peer mediation program, and the district's Autism Behavioral Consultation Team. She also co-collaborated on establishing the County's suicide prevention program known as ROADS. She later worked at the elementary school level, taking on the role of PBS coach and district coach for trauma and mindfulness. Jodi has also been on the County's Truancy Task Force and worked to implement Coordinated Care Wraparound Supports. She also had a role in implementing a homeless shelter. She currently serves as the middle school social worker.